Wild Rose's Brewer's Tap is a new beer almost every week. About a year ago, Wild Rose Brewery of Calgary, Alberta started its Brewer's Tap programme. I wrote an article about this programme for FFWD Weekly, a Calgary-based arts and entertainment weekly. Using a pilot system, Wild Rose allows its brewers to make small batches of interesting beers. A new beer is released almost every week and they typically only last a day or two. The brewers are given free reign, so their creativity is expressed in unbridled fashion. It is the nature of experimentation that some will be successes and some will be failures. But when the brewers hit their mark, unhampered by style guidelines and accountants, it is a wonderful thing. It's no secret how much I love Wild Rose for doing this. While I love it when a brewery makes a world-class example of a historic beer style, I do feel that some breweries are shackled by pressures to brew to style, either to appease a perceived consumer demand or to win awards. Wild Rose's regular line up, which includes an IPA, a brown ale and a bitter (among others) fulfills that requirement. So the Brewer's Tap beers can be decidedly outside the box. This satisfies many objectives. First, the brewer's are allowed to unleash their creativity. Second, they give beer lovers an unending supply of new things to try. Third, the most successful Brewer's Tap beers can form the basis for a future seasonal beer. Such was the case of Wild Rose's last seasonal beer, Natural Born Keller, and will be the case for Wild Rose's next seasonal beer, a gose. I've been able to try about a dozen and a half of the Brewer's Tap beers. Here are a few of my favourites. 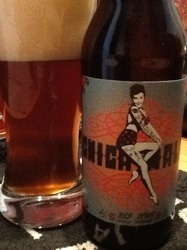 Wild Rose American-Belgo Early Summer IPA - This beer weights in at 6.9% ABV, but it is dangerously drinkable. The flavour is medium-bodied, but dry and bitter-balanced. 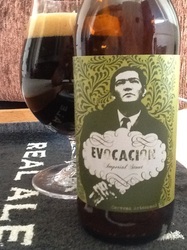 The first impression is hop spiciness, but then a Belgian-yeast spiciness emerges in the finish, including some clove. As the beer warms, there is a greater emphasis on dry, spicy flavours enhanced by pithy citrus fruit bitterness. Wild Rose Barrel-Aged Belgian Sour Wit - This beer was made with salt, so it could have been called a gose, rather than a wit, but the Brewer's Tap programme is not to be shackled by these terms, so we'll ignore that. Instead, we'll focus on the flavours. It is dry, but not overly so. It has a nice, light fruitiness with a very subtle saltiness. To me, there is more sensation of salt than flavour of salt. The beer has a lower level of carbonation, so it is the salt that provides most of the texture to the beer. Check the board to see what Brewer's Tap is on offer. Wild Rose Dunkel Weizenbock - This beer features lots of spice from its yeast, including a hint of cinnamon. There is also a hint of bubble gum and confectioner's sugar. The malt foundation is gently sweet with hints of chocolate and molasses. Wild Rose Farmhouse IPA - The yeast in this beer contributes some phenolic notes, but these are balanced against wonderful, fruity hop flavours. 5.7% ABV. In terms of beer, Mexico is best known for light lager, served in a clear bottle with a wedge of lime shoved down the neck. Craft breweries are few and far between in the Land of Enchantment. But some do exist. Of course, beers from Cervecería Cucapá are fairly widely distributed, but there are others as well. I recently sampled three beers from a nanobrewery in Oaxaca, Mexico called Teufel Nanocerveceria. They are so small, they don't even have a website, though they have set up a Facebook page. 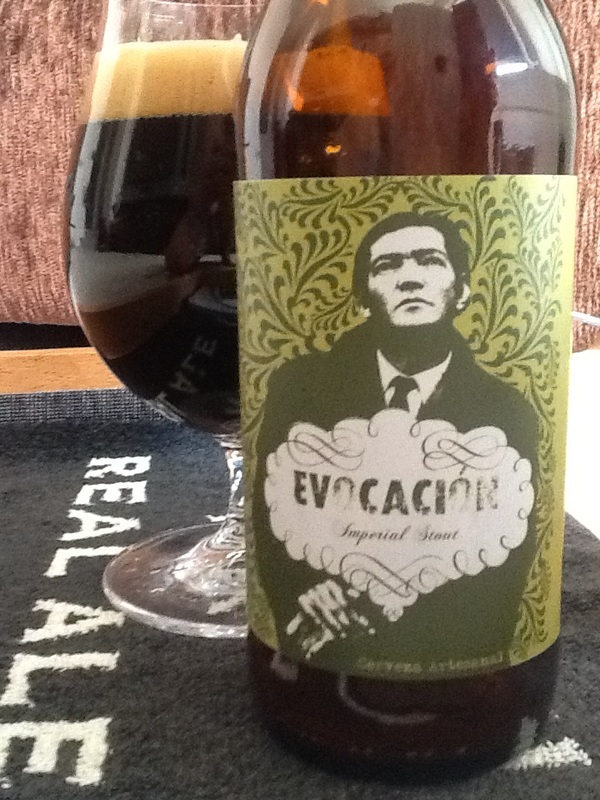 Teufel Evocación Imperial Stout - Appropriately opaque black, this 9% ABV imperial stout pours with a nice, brown head. 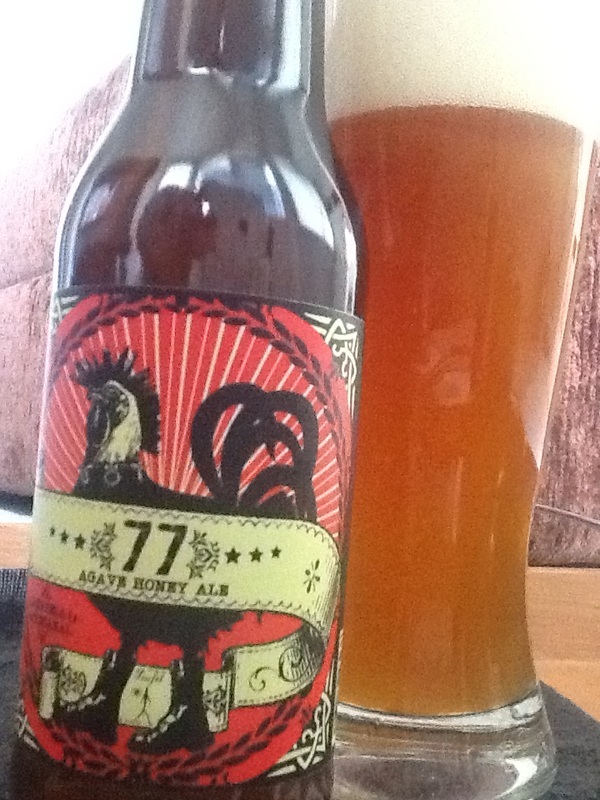 It has a nice maltiness with a nice molasses note in both its aroma and flavour. The balance favours the sweet side, though this is balanced against a touch of smoke. Teufel Chica Mala Red Stout - I'm not sure what a red stout is, but this beer is dirty copper in colour and is hazy. It has a very high level of carbonation, as evidenced by an extreme amount of beading through the beer. The nose of the beer has a nice fruitiness with a touch of sugar. The flavour of the beer is medium-bodied. It is lightly sweet with a nice fruitiness and a gentle tartness. 6.3% ABV. 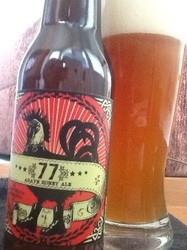 Teufel 77 Agave Honey Ale - Agave syrup, which is referred to as agave honey, is used in the brewing; no honey is involved. The flavour of this beer is medium-bodied. While there is a light sweetness, there is also phenolic flavour that is reminiscent of peaty Scotch. This is certainly an interesting beer! 5.5% ABV. Labatt Blue and Wild Rose Ten to the Fourth Pomelo Pale Ale, my first and 10,000th beers, respectively. It's been a long, but very fun journey. My Dad gave me a sip of his Labatt Blue many years ago. I remember running to the kitchen so I could spit it out in the sink. My opinion of that particular beer hasn't improved much since, though I could probably actually drink it now if I had to (for example, if I were stranded on a desert island and it was the only thing safe to drink). Little did I know that this awful introduction to beer was the first step in what would become a journey not merely in discovering great beer, but also in meeting fantastic people, travelling the world and enjoying culinary delights of all kinds. I started keeping track of my beers about 15 years ago. I bought a book that had tasting notes of hundreds of beers. I went through and decided to check off the ones that I had tried. After that, I just kept track of every new beer I tried. Early on, that was dozens per year. Then, I set myself the goal of trying 365 new beers each year. Now, I try between 800 and 1,200 new beers each year. I am not a ticker. I have full tasting notes on each of the beers I've tried. It is over 1,200 pages of tasting notes, in 10-point font, in one gigantic Word document. It's cumbersome, but the task of transferring 10,000 tasting notes onto some other platform is too daunting for me to even consider. Anyway, around a year ago, I knew that my 10,000th would be this year. So I talked to a local brewery, Wild Rose Brewery, about brewing a beer to be my 10,000th. Arrangements were made, recipes were formulated, beer was brewed, invitations were sent and, finally, my 10,000th beer was drunk. On April 10, many of my beer-loving friends gathered to share in the beer. Brewed with pomelo (a large citrus fruit), the beer was dubbed Ten to the Fourth Pomelo Pale Ale. Masterfully brewed by the artisans at Wild Rose, it had a firm malt foundation that supported the citrus flavours of the fruit. The pomelo was able to play lead role, with the underlying beer playing all the appropriate supporting roles, but without upstaging the fruit. I loved it. In addition to celebrating the milestone, attendees were asked to make a donation to my favourite charity. $860 was raised for Providence Children's Centre. Good beer for a good cause. My very good friends Suzanne and Guy Lembach are very generous. They gave me one each of the four 2012 Sierra Nevada Beer Camp beers commercially brewed by Sierra Nevada based on the best recipes made at that year's Beer Camps. Sierra Nevada Beer Camp #53 Floral IPA - This copper-coloured beer pours with a huge head. Head retention is good and lacing is in thick tufts. The aroma of the beer has a nice malty foundation and wonderful hop aromas. Interestingly, the rose hips and rose petals used in making this beer seem to add a sort of spruce-like aroma. In many respects, this beer smells like Orval, my favourite of all of the Trappist beers. This passes through to the flavour as well. As I taste this beer, I am reminded of Orval with its pleasant dryness which allows floral characteristics come through. I love this beer. 5.9% ABV. Sierra Nevada Beer Camp #43 Imperial Pilsner - This beer is only 5.6%, so it really not all that Imperial. That said, it's a great beer. As you can see from the photo, it is highly carbonated and pours with a enormous head. The beer itself is pale gold in colour and clear. As all good pilsners should have, there is a nice beading throughout the beer. The aroma is light in strength with a gentle graininess and a touch of grassy hops. The flavour is very well-balanced with a soft malt sweetness balanced against a clean hop bitterness. The hops also contribute some grassy flavours. Sierra Nevada Beer Camp #65 Imperial Red Ale - This beer is deep amber in colour, but has some ruby influences. It pours with a large head with good retention. The nose of the beer is decidedly malty with a hint of molasses. The flavour is medium-bodied and balanced to the sweet side, though only slightly so. The malt foundation has a touch of roasted flavour and a hint of metallic. This is accompanied by a nice, earthy, hop bitterness. 8.1% ABV. On February 16, 2013, some beer-loving friends gathered for an epic tasting of 18 exceptional beers. The highlight of the day was the side-by-side tasting of the four expressions of Eclipse Imperial Stouts made by Fifty Fifty Brewing Co. of Truckee, CA. We sampled the 2011 vintages of these beers. The base beer is a 9.5% ABV imperial stout. 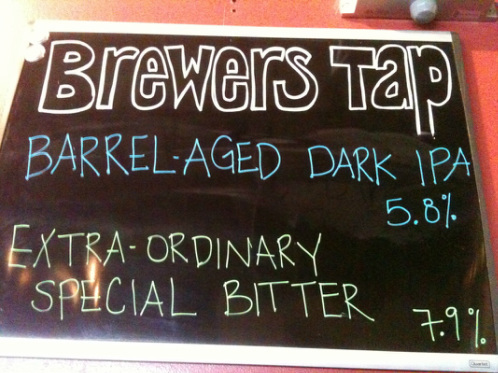 This is then aged in three different barrels, with a fourth version of the beer being a blend of the other three. The four versions are differentiated by the colour of the wax used to seal the bottles. All four of these beers rate 99 or 100 on RateBeer. The base beer is opaque black and all versions pour with minimal head. It is opaque black with an oily appearance. It has a low level of carbonation and an oily presence in the mouth. My favourite of the four was the burgundy-wax, brandy version. Although brandy is quite sweet, this version was notably less sweet and more balanced than the other three versions. Also interestingly, while the base beer was, of course, the same as in the other expressions, the body on this version was a little less full. Flavours of brandy were present and provided great, fruity accompaniment to the chocolatey imperial stout. My second favourite version was the Grand Cru, which came in a copper-waxed bottle. It seemed to have a bigger bouquet than the other three versions, with more toast, cookies, molasses and chocolate. Similarly, the flavour had strong notes of molasses, chocolate and wafer cookies. The contribution of the bourbon was in balance with only subtle notes of pepper and vanilla. Next was the Rittenhouse Rye barrel, which was capped by green wax. The gently spicy flavour of the rye was a nice contribution to the underlying imperial stout. Of the two whiskey barrel versions of Eclipse, this Rittenhouse version had more pepper and less vanilla. Who doesn't like chocolate chip cookies? 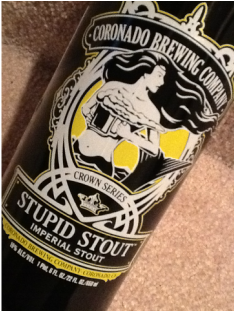 This imperial stout from Coronado Brewing Company has an oily appearance as one would expect from a beer that kicks up 10% ABV. Its aroma is surprisingly light and its high alcohol gives off an aroma that is reminiscent of green apples (technically called acetaldehyde). But that is where the comparison to fruit ends. The flavour, which is full-bodied and rich, is very sweet. It has flavours that are reminscent of cookies. These combine with a rich, sweet chocolate flavour, though at times, there is just a touch of smoky bitterness as well. I guess you could say these are slightly burnt chocolate chip cookies. I hesitate to say that, because that sounds bad and there is nothing bad about this beer. Yummy, yummy, chocolate chip cookies! It's not very often that you get to try a beer from Greenland, but Nanook Pilsner from Nanoq Beer Company is the third offering I've had the privilege of trying from Qaqortoq, Greenland. Like all good pilsners, Nanook Pilsner pours with a large, white head. Capping a golden beer, this head evidences a high level of carbonation and yet the beer has a soft presence in the mouth. This allows a gentle sweetness to shine through, accompanied by a lightly grassy hoppiness. Crew IPA and Pale Ale. Germany is known for lager, with only rare exceptions. In particular, the breweries of Munich are world famous for helles and dunkles, and to a lesser extent, hefeweizen. 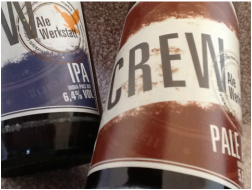 So, it was a bit of a surprise to be given samples of a pale ale and an IPA from Crew Ale Werkstatt of Munich. The Crew Pale Ale has a nice maltiness that features a touch of caramel, though the balance favours the bitter side. Meanwhile, Crew IPA does start on the sweet side, but the balance tips to the bitter side afterward. The IPA's sweetness has a touch of molasses, while the gently bitter finish has a light, orange-like hoppiness. Crew Pale Ale weighs in at 5.6% ABV while Crew IPA is 6.4% ABV.